I have many PCBs that use an AVR in SMD packaging, and since I frequently change the firmware in prototype boards, I'm trying to come with the best solution to program the AVR quickly and easily. The first approach was to have a standard header (2x5 pins, .1") on the board, but since these are bulky (for the size of the boards I'm dealing with), I started to have just the contact holes without soldering the header, and bent the pins of a header with a plier so I could "snap" it in and out the board. Not an optimal solution, but it worked. The next step was to use gold fingers (i.e. one edge of the board would have some contacts exposed, like those old ISA boards, but with just a few contacts of course). The problem with it is that the board cost increases, and still uses a lot of "real estate". Any suggestion for small+cheap+clean alternatives? Ideally, without having to solder anything on the board (like with the gold fingers). I was thinking about just some small contacts on the board and maybe two aligning holes, if there's a connector that could fit there and by some way stay in place while the programming is done. BTW, although the standard connector has 10 pins, only 6 are required. Take a look at www.tag-connect.com. They supply programming cables that mate to a small board pad layout. Include the layout on your board and your all set. Go with a set of test pads, if you're going for a production run. You can easily get at them with pogo pins - you stick them into a breadboard at predefined locations, and just press your board against it. I've been using this approach for Microchip's ICSP quite well - it also allows you to put the contact pads almost anywhere on the PCB - which simplifies routability for dense circuits. Adafruit has a nice pack, but they can be purchased from a warehouse distributor like Digikey(US) or Farnell(EU) as well. Take 3 PCBs of your target device. PCB #1 is your target PCB - it will be programmed, and you should populate it fully. PCB #2 is the guide PCB - drill holes (large enough for pogo pins' head) through all the test pads - it's easier since you see the location. If necessary (such as no mounting holes to begin with), drill holes for spacers too - you're sacrificing this PCB, if you are concerned with the cost at small volume, copy the design over to a blank plastic board, and use it instead. PCB #3 is the connected PCB - again, drill holes through all the test pads, this time large enough to fit the tail of the pogo pin. Drill holes for spacers - this is also a sacrificial PCB. Solder the pogo pins to PCB#3, at such depth that the heads stick out 5mm above PCB#2, with the spacers you have. Solder all the required cables. Apply eletrical tape or insulating lacquer on PCB2. Screw the spacers in, screw the PCB#2 above. This should look like there are just heads of pogo pins sticking out. Press the target PCB#1 aligning it with PCB#2. I thought this was interesting because in this arrangement the pogo pins held the test board in place in addition to providing the electrical connection. If you use pogo pins that press against pads, you also have to find a way to constrain the board so that the only degree of freedom is in the pogo pin actuation direction and you must provide continuously light pressure. That is you have to make a test fixture. With the method I suggest you don't have to make a test fixture. While looking for a solution to the same problem, I came across the Pogo-Key, an open source board for creating a pogo-pin based programming key. Similar to the Tag Connect ones mentioned earlier, that you can build yourself, but without the registration pins or legs that clip it in to your board. I build a small adapter PCB using the Staggered SOLO Stacker from AVX for programming AVRs. See http://daniel-spilker.com/blog/2011/04/25/isptouch-for-avr-microcontrollers/ for details. I also created an Eagle library since the adapter requires a custom footprint. For tight boards, I use a set of pads sized for a 1.27mm pitch pin-header strip, with holes just big enough for the pins. For handheld connection, use fairly long pins (8-10mm), and you just insert the pins, and hold them with pressure applied parallel to the PCB, so the springiness of each pin provides a good contact against the sides of the plated holes. Go with fingers without the gold plating. Why do you need the high reliability of gold fingers when the board connector will be handled in real time? Use a board edge connector to make the contact. You do not actually need 6 pins for ISP, especially if you can re-use the board's power connections. In addition to the ground reference, you need reset, clock, and two directions of data, for a total of 4 or 5. At that point, you can use a single row header, un-soldered, and hold the header pins at an angle to the board to insure contact. The advantage of this over pogo pins is that header pins are more durable, cheaper to replace (use a socket on your cable and a replaceable loose strip of pins in between), and available in higher pitch density. Pogo pins do make sense when you have a lot of connections to pick up, need to clamp the connection for operations lasting beyond a few seconds, or when they are scattered around the board rather than in a conveniently short row. But they require you to design something of a fixture. Not the answer you're looking for? Browse other questions tagged pcb avr connector or ask your own question. attiny13a SMD production programming without programming jumper? Possible? 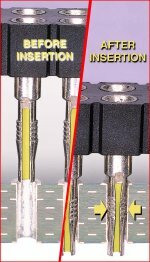 Are there data connectors designed to fit through small round holes? Ideas to stack multiple PCBs on top of each other? What are those wire terminals that mate with standard header pins? How to add Mouse Bites or V-Groove to PCB In Altium? How can I make connection on pcb (circuit board) holes without solder (for prototyping)? 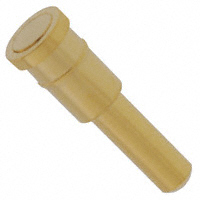 Which surface finish for edge connector plating to increase number of mating cycles with sliding spring contact? Is there a device which replaces soldered pin headers? What connector can be used for dimmer output?